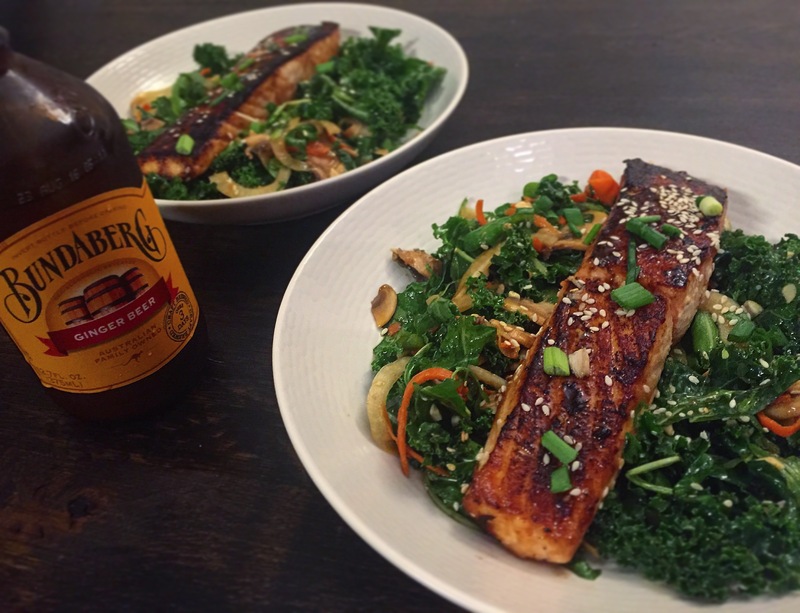 Giving in to the Kale Craze: Ginger and Soy Glazed Salmon over Toasted Sesame Ginger Kale Salad – Pao Says, "Open Wide!" YOU GUYS. I’ve never been a huge kale fan. I find it can sometimes be kinda bitter and tough for my liking. BUT… I messed around with some Asian flavors and decided I could eat this salad for days on end. It’s balance of sweet, spicy, and savory, it’s variety of textures, and it’s added bonus of being pretty darn healthy make this salad an amazing dish. You can make the kale salad with the salmon (super tasty combo), but you can also use the glaze I made for the salmon on pork tenderloin (tested, tried, and true), chicken, or shrimp. Usually, I don’t love salad leftovers bc the dressing wilts the lettuce and makes it kinda mushy. But the kale hold up to the dressing and a slightly wilted kale salad next day is actually pretty addicting- definitely a dish to make for dinner and save leftovers for next day lunch. Mix the soy sauce, brown sugar, Dijon, olive oil, and grated fresh ginger until combined. Pour marinade over the fresh salmon and let it marinade for 20-30 minutes. Preheat the oven to 425 deg F. Heat up a cast iron over med-hi heat. Drizzle a bit of olive oil in the pan and cook your salmon (skin side down if skin-on), for about 3 minutes (salmon about 1 inch thickness). Toss in the oven for about 6-7 minutes, and then plate over your kale salad! Put all the ingredients in a mason jar (or tightly sealed container) and shake it up until emulsified! I added the dressing and topped with scallions, red pepper flakes, and sesame seeds. I found that letting the salad sit with the dressin for about 20 minutes before serving tenderizes the kale a bit and really lets the salad absorb some good flavor!